Fig. 1 Lettuce plants growing in miniature garden beds. Raised-bed gardening can improve plant growth, conserve resources, and prevent soil compaction and erosion. Let me explain. The use of an enclosure, no matter how simple (Fig. 1 and Fig. 2), allows soil and other soil-amendments to remain in place - defying erosion. Garden beds define the places that are exclusively for plants and are off limits to traffic. Water and fertilizer can be applied right where they are needed. We experimented on using Redwood fence boards to make simple garden beds. The soil underneath is relatively good hence there was no need for a deep bed. Some of the beds were made small to facilitate succession planting. A new crop can be planted in a bed without having to wait for the other beds to be ready. Succession planting prolongs the length of harvest season for any given crop. So far, I am very pleased with the outcome of this experiment. Fig. 2 Good soil is contained in the garden box. For the small spaces in your garden, try these easy mini-garden-beds. Flowers are a necessary fixture in any special occasion and roses are the often the top choice. In celebration of Mother's Day, I thought of presenting all my viewers pictures of the beautiful roses that are currently in bloom in my garden. Many times in the past I was deceived by our spring weather. It would start to get dry and warm by March and I've interpreted those as a signal to plant warm-season vegetables. Then we would get a sudden cold temperature damaging young plants. This year however, has been mild that I was able to grow cool-season crops before it got too warm. The temperature is staying consistently pleasant and gradually increasing. The weather has been very favorable for starting new plants - both annuals and perennials. As I write this post, the temperature outside is close to 80 degrees F - the warmest day of the season (in our area), so far. This is my first time planting 'Rainbow' Swiss chard in my garden and I am glad I did. They are very healthy and colorful (Fig. 1 and Fig. 2). They are very nutritious and yet they look so ornamental. I have a pomegranate tree growing in a large pot (Fig. 3) and I thought of planting a fast growing annual crop with it. The tree was still leafless at the time of sowing; now its leaves provides a slight shade for the arugula. This arrangement works really well that it will surely be repeated next year. I did the same thing last fall when I planted bok choy with a Ficus tree. I planted two varieties of lettuce namely, 'Red Sails' and 'Black-Seeded Simpson'. Both varieties have similar growth habits (Fig.4); the leaves are crumpled with edges that are frilly. 'Black-Seeded Simpson' has bright and almost-neon green leaves. 'Red Sails' is an award winning variety with glossy red-purplish leaves. It is fast maturing (45 days) and resistant to bolting or flowering which allows for a prolonged season of great tasting lettuce. Basil are just emerging with their first set leaves, pole beans seeds were planted last week. Fig. 5 Easter Sunday: Kids invaded the vegetable garden in search of eggs. It's that time again when plant parts that we consider food begin to find their way to the kitchen. Like a celebrity at the peak of her stardom, 'Zephirine Drouhin' was the most photographed subject in my garden yesterday. The warm sun seemed to have pulled the sepals away from the buds giving way to the petals to explode into beautiful cerise pink flowers. 'Zephirine Drouhin' roses flank our garage doors - adding a romantic look to the otherwise drab section of the house. When in bloom, they command a great deal of attention to passers-by. 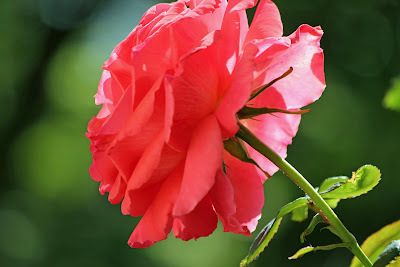 Visitors who get close to them also notice the pleasing fragrance of the flowers. 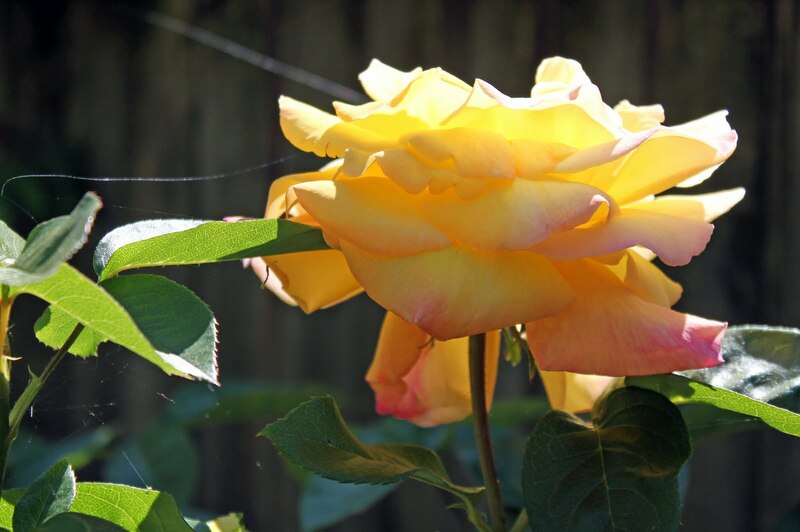 Technically speaking, climbing roses are not climbing plants. When I say climbing plants - these are the plants that are naturally capable attach themselves to structures as they grow such as clematis and ivy. 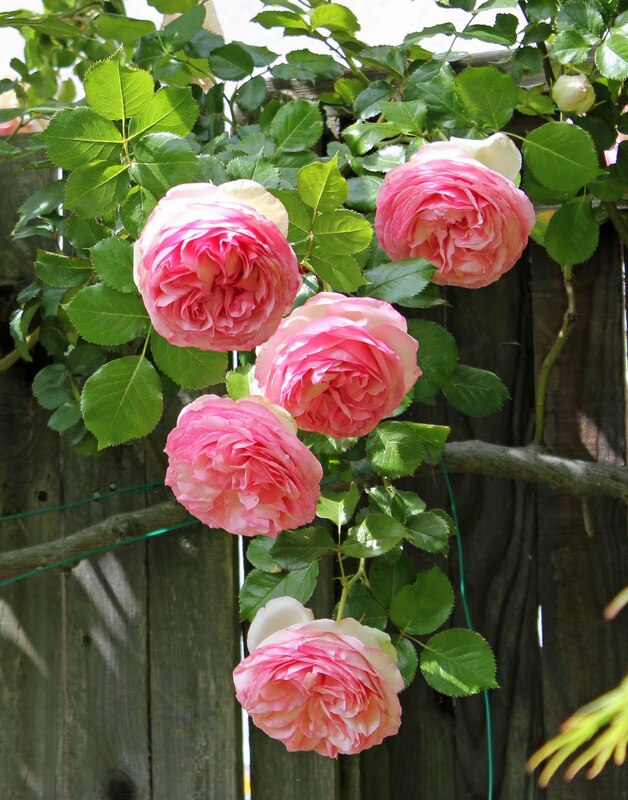 Climbing roses on the other hand, have long canes that can be trained to grow upwards on structures. 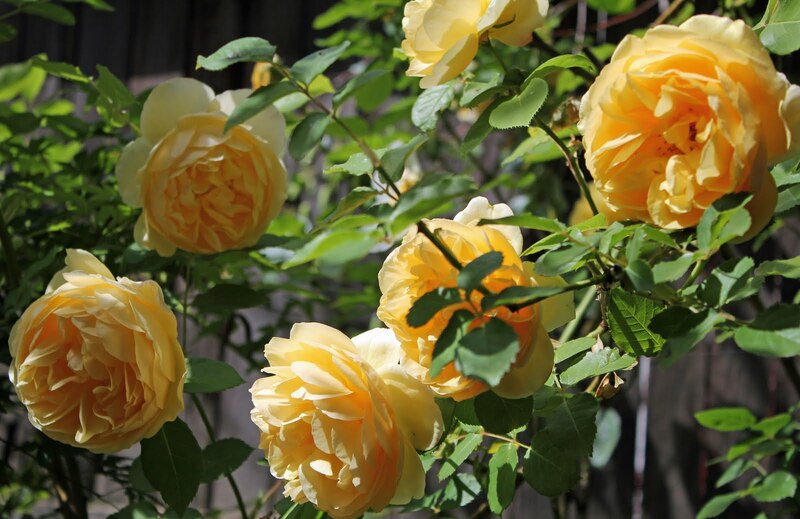 This is the case with my 'Zephirine Drouhin' roses. The canes are supported in place by thick wires that hang under the gutter. This rose has pale green leaves (I used to think that it was always in need of nitrogen fertilizer). They seem to be tolerant to shade; my roses are plated on a north-facing side of the house which allows only the afternoon sun. 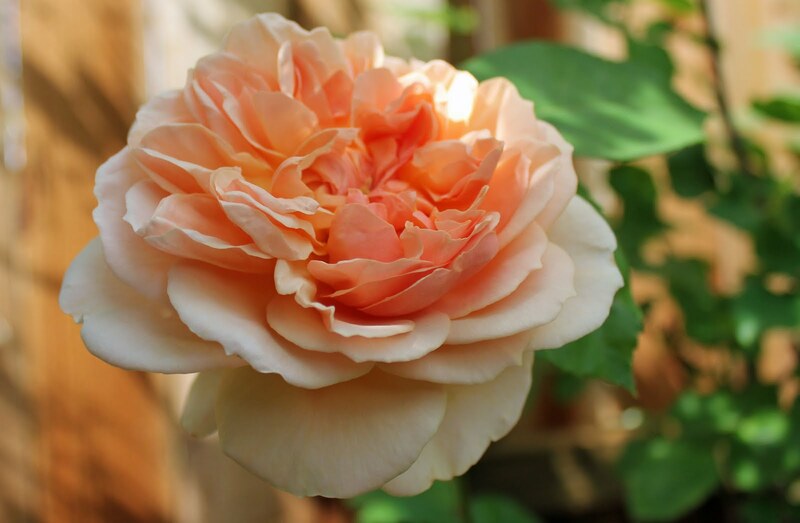 This bourbon rose is a repeat bloomer. But my observation is that is susceptible to aphids and sometimes black spot and leaf rust. It could be attributed to the shorter period of exposure to sunlight. 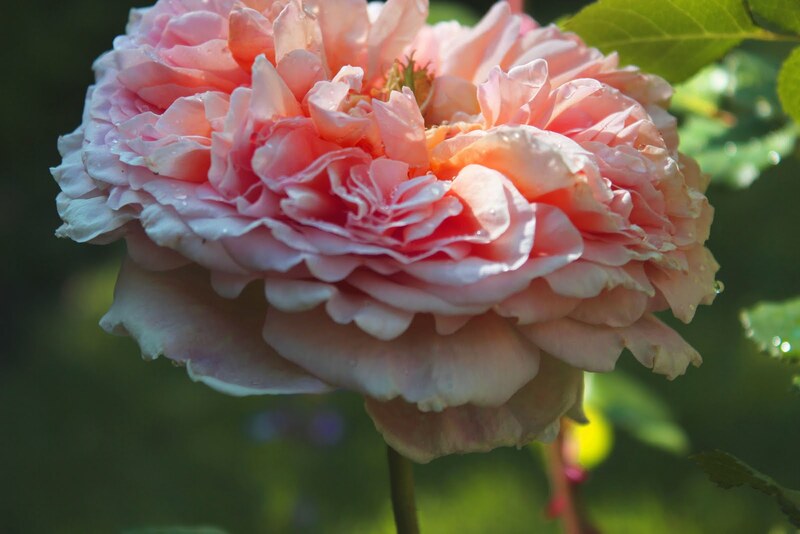 'Zephirine Drouhin' - old fashioned, thornless, vibrant pink, and shade tolerant.